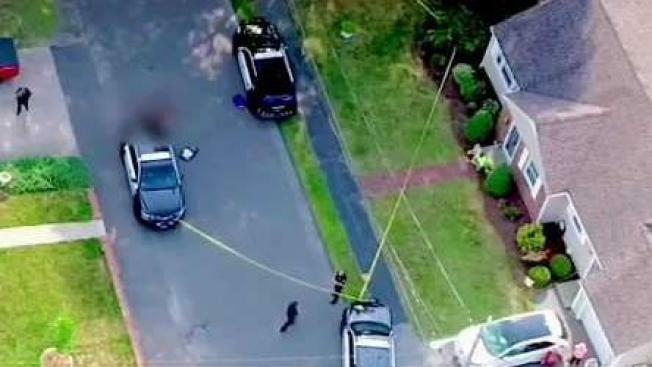 Court documents are revealing new details about the fatal shooting of a Weymouth police officer and an elderly woman on Sunday. According to court paperwork, Weymouth police were looking for Emanuel Lopes after he was reported speeding and crashing a car belonging to his girlfriend's mother on Sunday. Lopes was allegedly throwing a rock through the kitchen window of a local home when Officer Michael Chesna saw him and got out of his cruiser. Chesna was standing in the middle of the street when Lopes threw another "large rock" 10 to 12 feet, hitting Chesna in the head. Chesna fell to the ground and dropped his gun. Lopes then picked up the gun and stood over Chesna, shooting him approximately 10 times - five toward his head and five at his chest and legs, according to court documents. Weymouth Officer Sean Murphy then arrived and said he saw Lopes standing over Chesna. Murphy shot Lopes in the leg. Lopes then proceeded to run through neighborhood backyards while holding Chesna's gun. According to court documents, Lopes entered the backyard of 100 Torrey St., walked onto the driveway and fired three rounds into the porch of the home. The Norfolk DA says Lopes fired the shots after he saw the woman inside looking at him through her window. That woman, identified in court paperwork as 77-year-old Vera Adams, was shot and killed inside her home. She was allegedly shot in the chest by Lopes, who was using Chesna's gun. Lopes fired either 15 or 16 rounds from Chesna's gun in all, according to the court documents. Authorities say Chesna was trying to locate the driver of a crashed vehicle when he spotted Lopes allegedly vandalizing a home. Prosecutors say Lopes, 20, will not be medically available for arraignment on Monday. He is now expected to be arraigned on Tuesday at either his hospital bed or in court.